Snack Girl can hear you all. Those aren’t fries, those are carrots! These, my dear readers, are “carrot fries” and they pack a wollop of flavor and vitamin A (758% of your daily value!!). I found myself making these because I had too many carrots in my fridge. I peeled the carrots and sliced them as thinly as I could without taking off any of my fingers. As I was working, I ate some of the crunchy fresh carrots. After roasting them, I found the carrot flavor to be intense. These were like “super carrots” and I couldn’t stop eating them. Non-stop carrot eating, as we all know, has taken down entire civilizations. I’m looking at you, Rome. Fries are very hard to stop eating, so why not make them with another root vegetable? The photo above is not of the entire serving. My serving size here is 8 ounces - half a pound of carrots! This photo is representative of about 1/4 of a serving. Heat oven to 450 degrees. Line a rimmed baking sheet with parchment paper. Slice carrots into thin strips about 4 inches long and ¼ inch wide. I might use avocado oil instead because of the higher smoke point (that's really hot for olive oil). Good idea though! I love these. I can't wait to try it - will be especially wonderful during football season when I need to nibble on something for three hours!!! Lol.,I've made butternut squash fries sort if like this but it's so hard to julienne the squash- I almost injured myself trying. Sounds like a great idea, but how DO you slice them so thin without risking permanent damage? I love roasted carrots! I've never tried them thin sliced roasted, but I will now. Kevin, you can get thin strips using any slicer, or REALLY thin using a vegetable peeler (we do it with potatos to get "potato strips" sort of like potato chips). Still my favorite carrot recipe is Chick-Fil-A's carrot raisin salad. I love it, and make it healthier at home by using less sugar and Greek yogurt instead of mayo. peal a large carrot wrap in a paper towel. cook till almost tender i use a toothpick to test. spray with evoo or butter flavor and salt. I will have to try with carrots. I use parsnips and put thyme,rosemary & sage or what ever combo you like that day and they are delish. Thanks for the better avocado oil, I have been using evoo also. I am curious about these. I can take or leave raw carrots, but I'm not a huge cooked carrot fan. Do you think it loses a lot of nutrients when it's cooked that way? 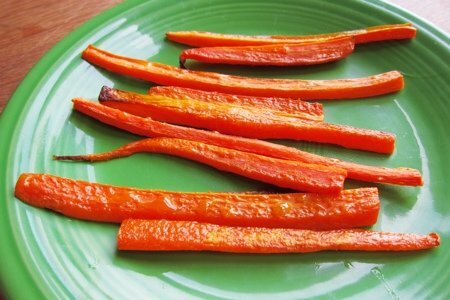 Roasted carrots are beyond spectacular. But they don't really fill that french fry craving. My favorite way to eat carrots is through cake, but this looks delicious and low-cal as well! Just made these for dinner. Perfect with salmon! No problem with using olive oil. what a great idea, i do this all the time with sweet potatoes, never thought of carrots!!! Snack Girl, I love these and it is so great to julienne and roast vegetables. Especially during the football season. I make a big batch of butternut squash and chomp till my hearts content. I was a little surprised at the points value since carrots are zero points on WW (or so I thought) so I would simply charge myself for the oil. Am I just ill-informed? On weeks when I don't have a weight loss I guess I have not counting carrots to blame? LOL. The carrots look good, this idea works well with Butternut squash as well, the squash reminds me of sweet potato fries only half the starch.